The Rt Rev. 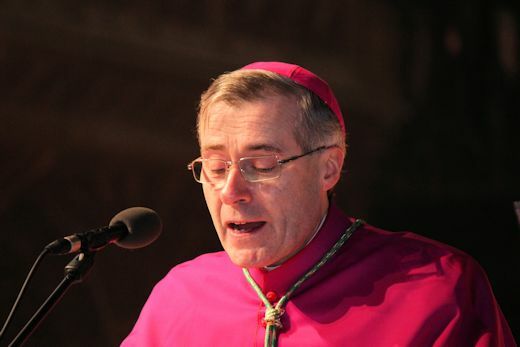 Mark Davies, the Bishop of Shrewsbury, has warned pilgrims in Lourdes of the dire consequences of Parliament approving an assisted dying Bill. He said that the Private Member’s Bill, due to be introduced by Labour MP Rob Marris on September 11, would lead Britain on the path to euthanasia and bring pressure to bear on some of the most vulnerable members of society. The Bishop declared that “we have good reason to fear that the right to die will quickly become the duty to die”. In a homily preached during Mass at the Lourdes Grotto, Bishop Davies said that in a place where the sick and frail are placed at the centre of our concerns it is “hard to believe that a law of despair is about to be rushed through Parliament” to remove legal protections from some of the most vulnerable members of society so they can be assisted to kill themselves. He told some 800 participants of the Shrewsbury Diocesan annual pilgrimage that they have just weeks remaining to raise their voices against these proposals. Bishop Davies said: “The proposed law for ‘Assisted Dying’ will remove legal protections for the lives of some of the most vulnerable in our land. “It is the first step on the road to euthanasia: the medical killing of some of the weakest members of society. “By the proposed law, those in our hospitals and care homes will be offered assistance to commit suicide. The very ones who should be accorded the greatest support will be legally offered help towards killing themselves. “Conscious of the sometimes scandalous neglect of elderly people in our present health and care provision we can imagine the pressures under which some of the most vulnerable will come if assisted suicide becomes the mindset of British society. “We have good reason to fear that the right to die will quickly become the duty to die. And those who should be most cherished and cared for will increasingly see themselves as an unwanted burden to society. Pope Francis frequently reminds us how it is the weakest and most vulnerable who can teach us the most important lessons of life. And he warns us that many societies are in danger of discarding them. The Bill is identical to that introduced by the assisted suicide campaigner Lord Falconer into the House of Lords last year except for a requirement for a High Court judge to approve applications for suicide within a fortnight of them being made. The Prime Minister, David Cameron, has expressed his personal opposition to the Bill but has granted members of the Conservative Party a free vote when it comes before the House of Commons. The Bill is opposed by the British Medical Association, all of the royal medical colleges and by an overwhelming proportion of GPs. All major disability rights groups are also opposed to the Bill. Bishop Davies made his remarks during Mass at the site where St Bernadette is believed to have received private apparitions of the Blessed Virgin Mary in the 1850s and created a great centre of pilgrimage for millions each year where the sick and the poor are a special focus of care.